Amid a crackdown on student and labor activism, dozens of students and graduates of elite Chinese universities have since August “been disappeared,” some violently “kidnapped” from public university campuses. Many of those detained in August and November roundups were Marxist activists–like Yue Xin and Sun Min, both Peking University graduates–who had been actively supporting Jasic workers in their quest to establish an independent trade union in Shenzhen. Last month, CDT translated PKU student Feng Junjie’s account of being beaten by thugs on campus during a November 9 episode. Apparently a mere passerby and not an activist, Feng wasn’t in the end detained, and the medical student called for university security to be held accountable for allowing his beating and his classmates’ detentions to occur. A shriek, a roar, cursing… On the evening of September 23, many students in their dorms heard all sorts of noises emanating up from downstairs. After a brief commotion, the scene fell silent again. Later, I learned the shriek had come from a classmate being wrestled down by a group of thugs, who then stuffed him into a car and took him away. Like the frantic splashing of a drowning man, the waves are quietly erased after he goes under. Long after these events took place, I learned the shriek we heard was from my classmate, Jia Shijie, of Clinical Class #4. That night, he said good goodbye to campus life. He has not since returned. Jia Shijie, student of Peking University Health Science Center Clinical Class #4. Two months later, an increasingly pervasive atmosphere of rough talk, violence, and intimidation had settled over the entire Peking University campus. A tendency of some university administrators to take measures to crack down on students has gradually come to the surface. As for me, I’ve finally summoned the courage to write down Shijie’s misfortune in hopes it will reach more people who can help him. August 28, 2018, 6:30pm. Shenzhen city government officials responsible for working with the official trade union discussed the workers’ rights incidents that occurred in southern China and Shenzhen with Peking University Health Science Center Student Work Department heads and more than ten School of Basic Medical Sciences professors. Four students were also there. Shijie was among them. These workers’ rights incidents garnered the attention of institutions of higher learning throughout China and abroad. Many Peking University students traveled south to show solidarity with the protesters as these incidents took place. But these four students had just completed a half-month-long military training program that very afternoon. There was no chance any of them had gone to the scene of the protests. “For today’s meeting, no one is to use their cell phone. Everyone put cell phones away.” As an administrator said these words, a school employee quickly gathered everyone’s cell phones into a bag. As Shijie later told me, he knew going in to the meeting that they’d likely take away everyone’s phones. This is a well-known tactic here in China. He had no choice but to comply. Besides, he didn’t think this meeting was going to be a big deal. Sure, he once entertained the notion of going down to the protests, but he had military training, so he never ended up going. All he did was follow the protests online and discuss his thoughts with other interested people. How much of an issue could they possibly have with that? The officials from Shenzhen showed them all a PowerPoint presentation on the workers’ rights incidents, presenting to the students an official account of the incidents from the point of view of higher departments. In their account, they claimed that “foreign powers” were behind the incidents. When they were finished, the officials made a demand: the four students must “admit wrongdoing” for following the incidents and sharing related information. Was it for spreading rumors, or for inciting unrest? If it was for neither, then what did they do wrong? Because the officials didn’t have good answers, some of the students absolutely refused to admit wrongdoing, some by remaining silent. In fact, related authoritative departments have operated on the edge of legality, putting their hands into students’ online public opinion discussions on more than a few occasions. Many popular social media platforms on campus have been “put on notice” by the school. In the last few days, Tencent announced a new rule restricting each WeChat account to just one public alias. Before a year ago, you could register five. At the Peking University Health Science Center, it seemed, public opinion was monitored even more closely than it was in Chinese society at large. Ever since Shijie left campus with his parents on September 11, I hadn’t been able to contact him. The other students in the program all assumed he went home because his grandmother was sick. As for whether or not he could return to school, no one knew. I kept sending Shijie messages over WeChat until the day before the 23rd, hoping he would come back to school as quickly as possible. He was behind on quite a bit of work needed to graduate. But his side of the chat window remained silent. The day he was taken away, Shijie’s blood-curdling scream shocked and disturbed many. As I found out from some other classmates, before the scream, Shijie had been dealing with several big thugs for a long period of time. It happened at the bottom of building #4. A police car was parked near where their argument took place. University Security Department personnel were also on the scene. No one clearly heard what the argument was about. But students in both buildings #2 and #4 heard them arguing. [name redacted] retracted a message. Other classmates posted on BBS message boards asking about what happened, but their posts quickly disappeared. Because I wasn’t on the scene when the events took place, it is difficult for me to reconstruct what happened. But just think for a moment about this kind of situation: Shijie did everything in his power to hurry back to school, hoping he could gain help from the school to allow him to continue his studies. But the Security Department stopped him and forced him to leave immediately. What would that have felt like? Actually, I can understand why Shijie yelled this. His family’s financial situation was never great. From a young age and all throughout his life, he had grown up with hardship. Because of this, he developed a warm yet slightly sensitive personality. Those who know him well all know that he doesn’t become angry easily–unless cornered. Perhaps at that point he already realized what he was about to face. As BBS post deletion increasingly intensified, some began asking “What happened downstairs?” on Shudong [a secret-keeping website]. Answers remained elusive. It was at this time that people began hearing that it was a drunk person. Seeing this, students looked at each other in blank confusion: The director of the Security Department got personally involved over students drinking? Since then, Shijie hasn’t once appeared again on campus. 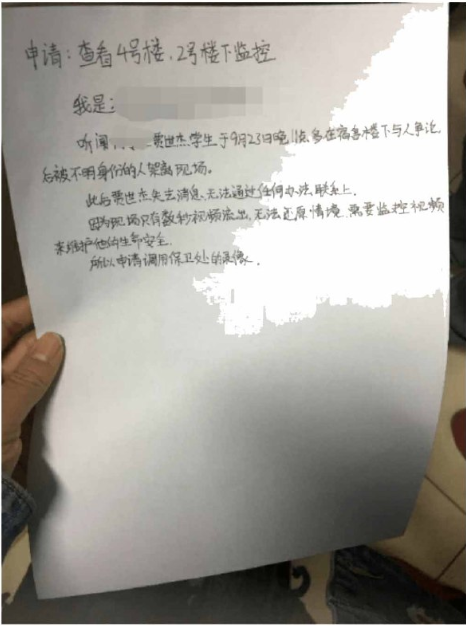 On the 24th, good friends of Shijie immediately contacted Shijie’s class representative, former roommates, current roommates, high school classmates, and department teachers responsible for student work. The answers they got were relatively similar. His class representative, current roommates and his student-work teacher all said Shijie had already taken a leave of absence from his studies. Surprisingly, some from Shijie’s hometown said they didn’t even know him. It was like this person had been banished to another time and space. Only Shijie’s former roommate expressed confusion: the voice last night really did sound like Shijie. And before the 23rd, his teachers always asked where he was at every class. Then there was this impressive scene. 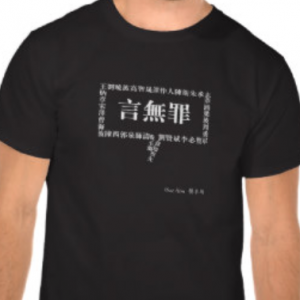 Once when one of Shijie’s teachers arrived to start class, a class representative was heard muttering, “Here we go again.” Then, as predicted, the teacher began taking roll call, and when he called Shijie’s name he also asked where he had gone. “He has taken a leave of absence,” the class representative patiently replied. 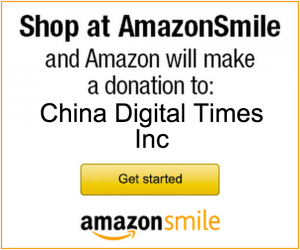 At the end of September, a classmate contacted Shijie’s mother. 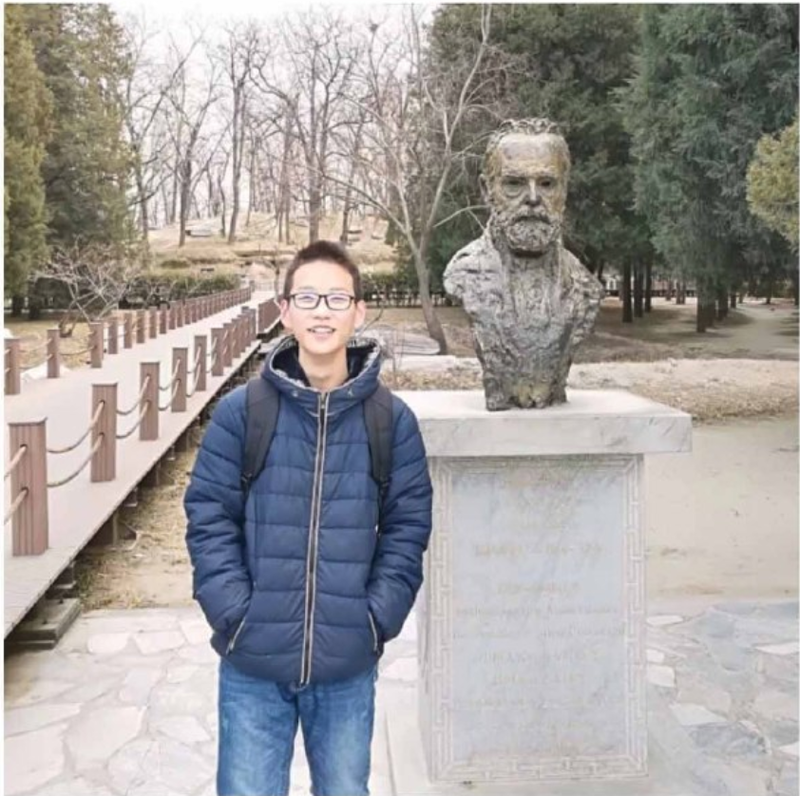 His mother mentioned that the dean asked both of Shijie’s parents to come to the school, saying it was because of some “bad things” Shijie had posted on QQ–not because his “grandmother was sick.” She also said Shijie would be able to return to school at some future time. It was just that she didn’t know exactly when. A student who got in touch with Shijie never would have thought that he himself would start to be monitored. 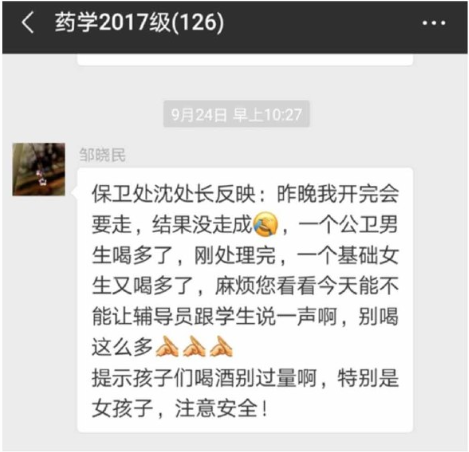 In mid-October, this classmate was called into a meeting with a department student-work teacher, who expressed: doing things this way is all for Shijie’s own good. The teacher also demanded that this classmate stop trying to contact Shijie or seek any information about him. Later, on the 24th, this classmate received a phone call from Shijie’s father, who was extremely emotional on the other side of the line. During this call, his father repeated the phrase “Shijie is no longer a Peking University student” multiple times. Perhaps Shijie’s parents were put under a great amount of pressure. If in fact there were people who sought to make Shijie disappear for awhile, would his parents go fight for their son, or would they choose to compromise because of their lack of power? The last time I attempted to contact Shijie was on October 29. A few classmates and I went to the office of the School of Basic Medical Sciences Party Committee Deputy Secretary, Guo Qi (I later had to leave early because something unrelated came up), in hopes that Teacher Guo Qi would be able to give us some answers regarding Shijie’s situation–exactly what was going on now with Shijie. But after Teacher Guo Qi saw the group of students, her expression changed. 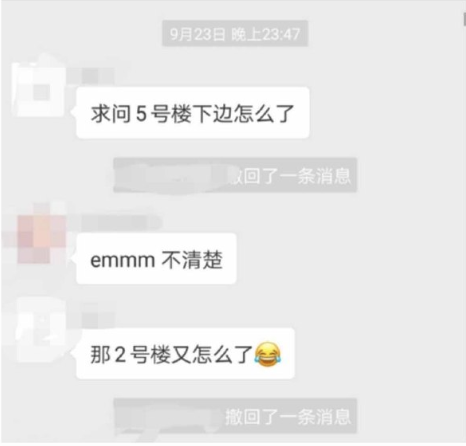 She very explicitly refused to give us information regarding Shijie’s situation, insisting this was personal private information. The students really didn’t want things to go down like this, so they resolved to go talk to Guo Qi again. We did not expect Teacher Guo Qi to lose her composure like no one had ever seen her do before. At times she said, “Ok, ok, ok, that was my mistake.” At other times she scolded the students, saying, “Don’t you have any basic respect for people?” She even banged on her desk to get the students to back off. When the students came out of the Deputy Party Secretary’s office, they went right to the Security Department to see if they could view security camera footage from the night of September 23. When they went the first time, an employee at the security office appeared anxious to help after hearing about the situation. He told the students they needed permission from the Student Affairs office in order to see the footage and had them quickly go write up a request letter. Hearing [redacted] student Jia Shijie in an argument with others at the bottom of the dormitory after 11pm the night of September 23. He was later forcibly taken from the scene by unidentified individuals. From then on, no one has heard anything from Shijie. No one has been able to contact him through any means. Because there’s only a few seconds of video of the event, we have no way to reconstruct what happened. We need the security camera footage to help protect his safety. However, when a student lost his food delivery in building #5, he was able to view the footage. But when your own classmate goes missing, loses contact, is even probably subjected to violence, had his personal freedom restricted… you aren’t allowed to view security camera footage. In November students used campus security camera footage to protect their rights. The moment I heard this, though Beijing had yet to enter deep winter, that feeling of inside-to-out cold will be hard to forget. This is all I know of the story. We are unable to find out anything for sure regarding whether he has been forced to take a leave of absence or forced to drop out of school. At this very moment, all I can think about is that one phrase that has now been repeated so many times–“What wrongdoing“? 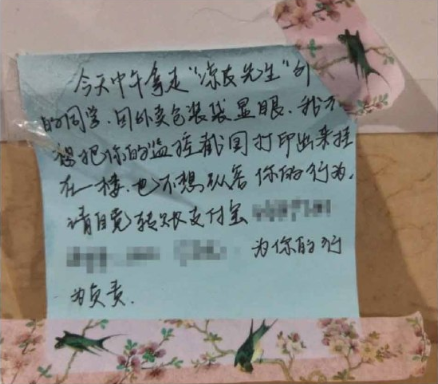 I write this only in hopes that more people interested in following Shijie’s situation can think of solutions together, solutions to save this student from such a humble family background who tested into Peking University. If any friends know of any other channels, I hope you can contact me. I am Shijie’s friend, Peking University College of Pharmacy Class of 2016 undergraduate student Shen Yuxuan. My phone number is 18801237715, WeChat ID Coolmaxdaily. What if we all were “disappeared” one day? If we can’t depend on each other, what else can we do?